Machine designed with a hydraulic power pack and control circuit for effortless loading unloading operation. A dial gauge in front measure depth of ball penetration. 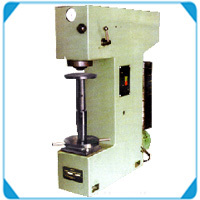 This facilites production testing within tolerance limits by compression method. Testing table 70mm dia with 'V' groove for round jobs 10 to 80mm dia. Telescopic Cover for elevating screw protection.